Ringling Bros. folded up the Big Top for the final time on Sunday night. 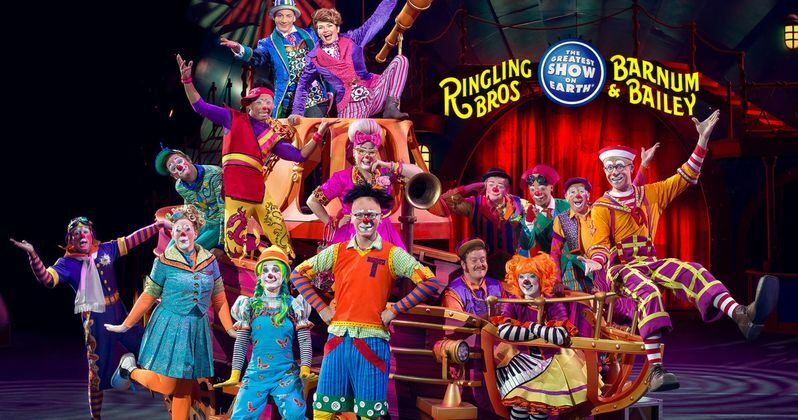 Ringling Bros. started in1884 and later merged with Barnum and Bailey in 1919 to form "The Greatest Show on Earth." The traveling circus roamed the United States for over 100 years, entertaining millions, and in later years drummed up plenty of controversy from animal rights activists. The final two shows were held at the Nassau County Coliseum in Uniondale, New York, which is about 30 miles east of New York City where former circus workers gathered with current workers from all over the country to celebrate the end of an era. The 146-year old tradition is actually older than American baseball and the final, sold out performances drew fans of all ages from all over the United States to see "The Greatest Show on Earth" one last time. The final performance was also streamed live on Facebook, where it has been viewed by over 1.2 million people as of this writing. The majority of the viewers left emotional comments bidding the circus goodbye and thanking Ringling Bros. for the years of entertainment. The emotional send off was extremely hard on the current entertainers, many who can visibly be seen crying and choking up while addressing the audience. "Let's go home and show everyone we are forever more the Greatest Show on Earth!" Ringmaster Johnathan Lee Iverson said to close out the show, leading to a standing ovation from the crowd. Ticket sales for Ringling Bros. Circus have been on a steep decline over the past decade for a variety of factors, but one in particular has been the rise of animal activists protesting the alleged abuse of the circus animals, particularly the elephants. Some have even deemed the circus as "The Cruelest Show on Earth." But as the circus life comes to end, Ringling Bros. has stated that their animals will all be going to safe sanctuaries and reputable, safe places all over the country while some will remain under the care of Ringling Bros. on their 200-acre property in Florida. Another reason for the decline is the rise of technology. Children are more or less plugged in and can't be bothered to be engaged with real-life entertainment. And on a personal note, Clowns are scary, no matter what. Before the circus started, the Ringling Bros. performed skits and juggling routines in town halls around the state of Wisconsin. They expanded their acts in 1884, adding a horse and a trick bear to the show while traveling around the country by train. It's when they started traveling that they ran into the competitors Barnum and Bailey where before joining forces, they divided up the country into regions. They later merged and "The Greatest Show on Earth" was born. The final performance began with Lee Iverson thanking the 300-person crew of workers and performers for their time with the company. It's a sad day when real live entertainment is having a hard time competing with iPhones, Xboxes, and the internet. Maybe the circus could continue without the animals, but in the end it would not have mattered all that much when kids can just watch it on Reddit or YouTube in the privacy of their bedrooms. This Christmas, Hugh Jackman will star in the musical The Greatest Showman, which chronicles the story of P.T. Barnum before Ringling Bros. and Branum & Bailey merged.